Shipping is FREE for all orders over $25.00 within the U.S. and Canada. All orders below 25.00 or international orders will have a standard shipping rate of $7.00 per order. Your package will be shipped air mail by usps unless otherwise requested. Express shipping is available at checkout. **INTERNATIONAL BUYERS** Please Note: For all countries outside of the U.S, Canada and the UK we ship First Class Airmail International. You will receive a tracking number to confirm that we have shipped your order however we will not be responsible for undelivered, lost or stolen packages. We are not responsible for lost orders submitted with an incomplete or inaccurate address. If you would like to pay by money order or a form not listed please contact us with a request. All Orders are processed and shipped out from our warehouse within 1-3 business days of order receipt, credit card approval or other payment method received. 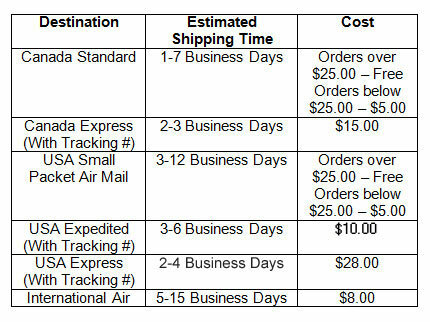 Shipping times vary depending on location and custom clearance times. Below you will see your estimated shipping time once your package leaves our warehouse. Please note orders cannot be cancelled and totals cannot be adjusted once submitted.